In front of a packed house on Wednesday night, DiBella Entertainment debuted its long-running Broadway Boxing series at Times Square's Sony Hall in New York City. The event was streamed live on UFC FIGHT PASS®, the world's leading digital subscription service for combat sports. Broadway Boxing is presented by Nissan of Queens, Azad Watches, OPTYX, Christos Steak House and Gagliardi Insurance. 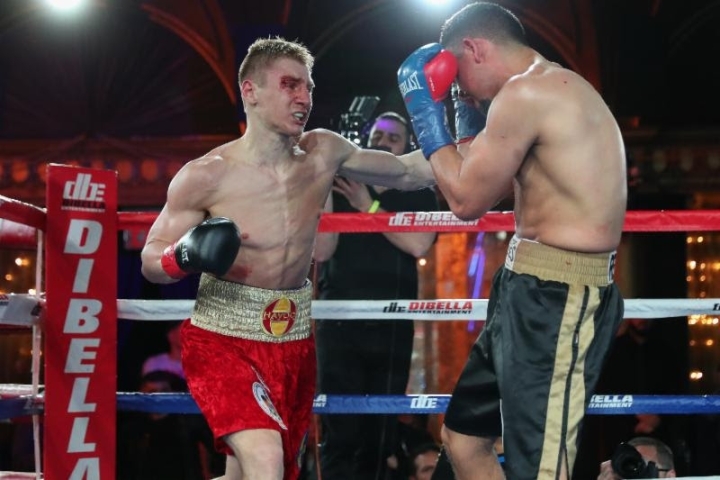 In the main event, Ukrainian welterweight contender Ivan "The Volk" Golub, 146.6, of Brooklyn, NY, defended his WBC USNBC title for the first time against Manuel Alejandro Reyes, 147, of Los Angeles, CA, in a 10-round battle of southpaws. Golub focused early on the midsection, pounding away with hooks to Reyes' ribs. Reyes, who was pressing forward, made his presence felt in round two when he opened a cut above Golub's right eye with a stinging left hand. With blood dripping down his face for the remainder of the contest, Golub began to time Reyes' advances with his jab-straight left combination to control the action. Left uppercuts sometimes punctuated Golub's combinations that snapped Reyes' head up. Though fatigued, Reyes endured Golub's relentless attack to hear the final bell. The judges tallied 100-90 twice, and 99-91, all for Golub via unanimous decision. Co-promoted by DiBella Entertainment and Fight Promotions Inc., Golub, 16-1 (12 KOs), has now won three in a row since his controversial decision defeat to Jamontay Clark in June 2017. Reyes' record dropped to 11-5-1 (5 KOs). As an amateur, Golub accumulated a 270-32 record, while becoming a five-time Ukrainian National champion, and won bronze medals at the Junior World Championships in 2006 and at the World Championships in 2009. He also participated in the World Series of Boxing, winning all five of his bouts. Former 2016 Uzbekistani Olympian Bakhodir "The Big Uzbek" Jalolov, 244.4, who trains in Los Angeles, CA, earned his sixth straight knockout since turning pro last May. The 6'7" heavyweight southpaw quickly bloodied the nose of late replacement opponent Brendan Barrett, 234, of Los Angeles, CA, with a stiff jab, resulting in Barrett taking a knee. Jalolov continued his assault when Barrett arose, blasting his adversary with a straight left to the chin for a second knockdown. The referee began a count then, seeing Barrett was in no condition to continue, decided to end the bout at the 2:45 mark of the opening frame. The win earned Jalolov, now 6-0 (6 KOs), the NABF Junior heavyweight title. Barrett's record fell to 7-3-2 (5 KOs). Co-promoted by DiBella Entertainment and Fight Promotions Inc., Jalolov was born in Sariosiyo, Uzbekistan, and is incredibly popular in his native country, with 175,000 social media followers on Instagram. He was a highly accomplished amateur compiling a record of 84-13. A four-time National champion from 2013 to 2016 and the #1 ranked amateur in the world before his pro debut, Jalolov represented his homeland at the 2016 Olympic Games and had the distinguished honor of being the country's flagbearer at the Opening Ceremonies. As an amateur, Jalolov won gold medals at the Asian Amateur Boxing Championships in 2017, World Cup Tournament, Liventsev Memorial Tournament, Great Silk Way Tournament, and Duisenkul Shopokov Memorial Tournament in 2015, and at the World Cup of Petroleum Countries Tournament in 2014. During his amateur career, Jalolov also focused on his education, earning a Master's Degree in Sports Science. WBA super middleweight women's world champion Alicia "The Empress" Napoleon, 156.2, of Lindenhurst, NY, took on Hungarian Eva Bajic, 153, based in Senta, Serbia, in a nontitle eight-round contest. With her hometown fans loudly cheering her on, Napoleon demolished Bajic in the second frame. A left-right combination floored Bajic shortly after the bell to start round two, then a crushing overhand right sent her back to the canvas. At the advice of the ringside physician, the referee halted the bout at the 1:04 mark. The charismatic Long Islander, now 11-1 (6 KOs), defeated Femke Hermans on March 3, 2018, to capture the WBA world title then made her first defense five months later. The Veteran Boxers Association honored Napoleon as the 2018 "New York State Female Fighter of the Year" at their annual Holiday Awards Dinner last year. She is an outspoken advocate for gender equality and has been featured on national TV, including on FOX 5's "Good Day New York" and the Pickler & Ben talk show. Napoleon competed as an amateur for nine years, winning 11 National titles, including two New York Golden Gloves championships and a National Golden Gloves title. Southpaw junior middleweight prospect Hurshidbek "Hershey" Normatov, 155, of Uzbekistan and now based in Brooklyn, NY, earned a six-round shutout decision against Calvin Metcalf, 154.4, of Kansas City, MO. Nomatov kept Metcalf at the end of his consistent jab and then found a home for short right hooks. One right hook connected upstairs in the third frame to deck Metcalf. All three scorecards read 60-53, improving Normatov's record to 8-0 (3 KOs). Metcalf now stands at 9-2-1 (2 KOs). As an amateur, Normatov accumulated a 190-40 record and won the European Amateur National Championships in 2014. Welterweight Brian Ceballo, 148.6, of Brooklyn, NY, promoted by Tom Loeffler's 360 Promotions, needed less than three rounds to defeat Dominican Ricardo Garcia, 148.6, of Reading, PA. In the third stanza, Ceballo felled Garcia with a straight right. Though he arose, Garcia was still hurt and Ceballo dashed in with a barrage of power shots, including a thudding left hook. The referee intervened, ending the bout via TKO at 2:33 of the round. The 25-year-old Ceballo, now 8-0 (4 KOs) as a pro, was a stellar amateur, compiling a 206-13 record while becoming a five-time New York Golden Gloves champion. Garcia's record dropped to 14-6-1 (9 KOs). Popular junior featherweight prospect Khalid "Pure Gold" Twaiti, 121.4, of Brooklyn, NY, kept the pressure on Jeno Tonte, 118, of Kecskemet, Hungary, forcing him on the back foot with a steady flow of combinations and power punches throughout. With Tonte unable to match Twaiti's intensity and taking too much punishment, the referee ended the contest via TKO at the 1:13 mark of round three. Now 5-0 (3 KOs), Twaiti turned pro in February 2017 after compiling a 74-15 amateur record. Tonte returns home with a 9-7 (8 KOs) record. Cruiserweight Joseph "Mack" Williams, 198, of Far Rockaway, Queens, NY, made his long-awaited return, following a near two-year ring absence, facing Jose Mario Flores, 198.8, of Woodbridge, VA, in a scheduled six-rounder. For four rounds, Williams dominated his game foe in an exciting brawl. Williams then kept Flores at bay with a stiff jab and combinations for the remaining two frames, en route to a six-round unanimous shutout, with three scorecards of 60-54. Williams upped his record to 13-0 (8 KOs), while Flores dipped to 8-2-2 (4 KOs).